The most common reason why a CD or DVD port falls back to PIO mode is a drive trying over and over to read a scratched or dirty CD or DVD. For repeated DMA errors. 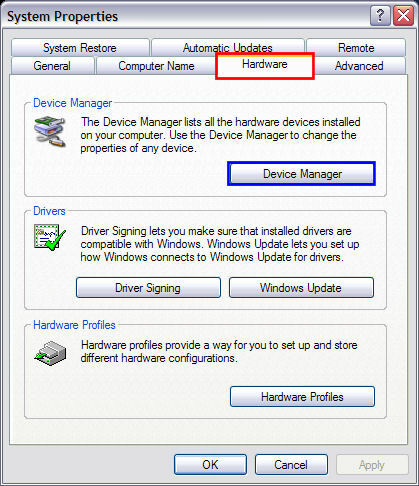 Windows XP will turn off DMA mode for a device after encountering certain errors during data transfer operations. 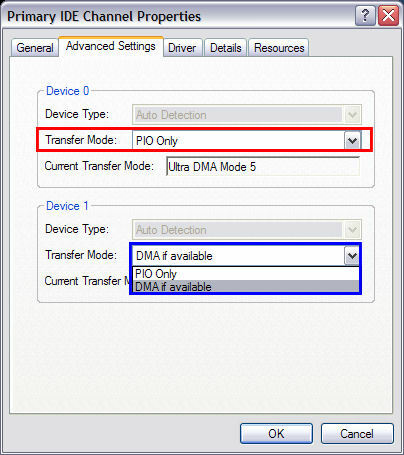 If more that six DMA transfer timeouts occur, Windows will turn off DMA and use only PIO mode on that device. 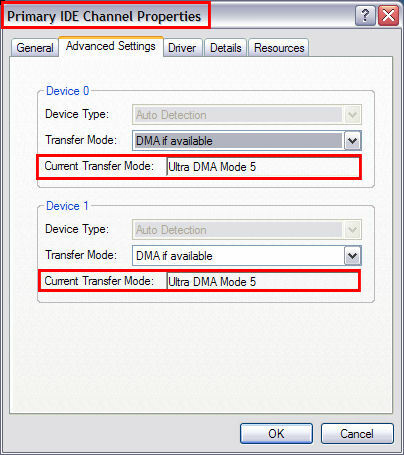 In this case, the user cannot turn on DMA for this device. 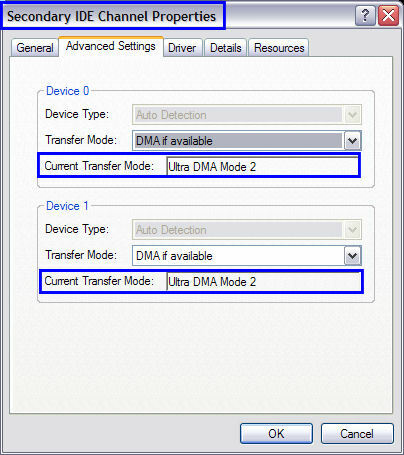 The only option for the user who wants to enable DMA mode is to uninstall and reinstall the device. All CRC and timeout errors are logged in the system event log. These types of errors could be caused by improper mounting or improper cabling (for example, 40-pin instead of 80-pin cable). Or such errors could indicate imminent hardware failure, for example, in a hard drive or chipset. 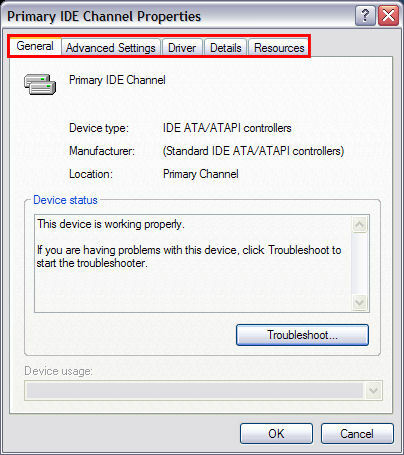 IN THIS GUIDE, I CHECK THE PRIMARY IDE CHANNEL FIRST, JUST TO SHOW YOU HOW. 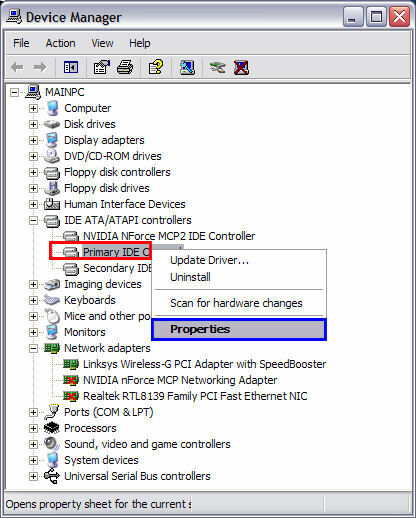 YOU MUST CHECK THE SECONDARY IDE CHANNEL FOR THAT IS WHERE YOUR CD/DVD DRIVES ARE. 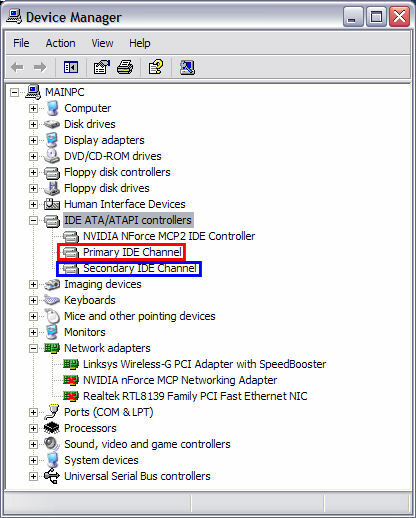 JUST RESETTING THE PRIMARY IDE CHANNEL TO DMA WILL NOT HELP IF YOUR SECONDARY CHANNEL IS IN PIO MODE. 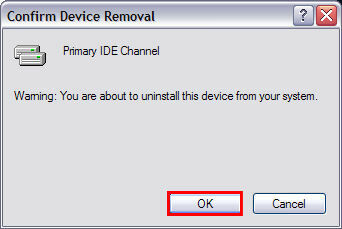 AGAIN, MAKE SURE YOU CHECK THE SECONDARY IDE CHANNEL AFTER CHECKING THE PRIMARY IDE CHANNEL. 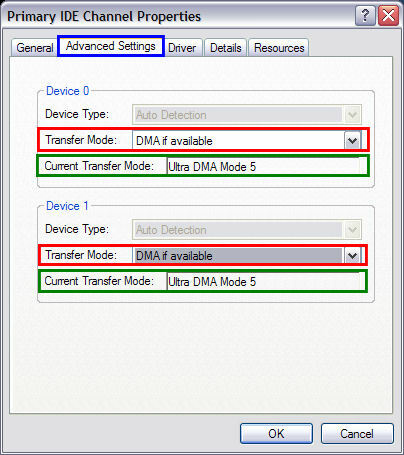 In this guide I will show you how to check your DMA status and reset it if necessary. 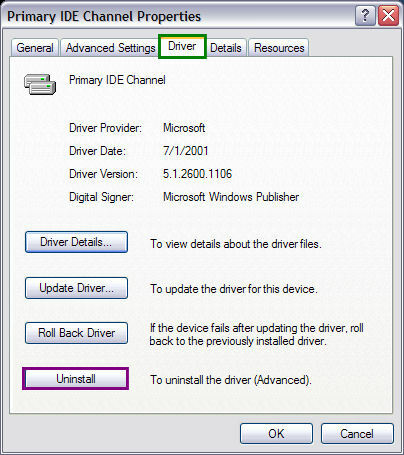 Generally your hard drives are on your "Primary IDE Channel" and your CD-ROM/DVD-ROM/DVD+RW drives are on the "Secondary IDE Channel". %90 of the time, only your CD-ROM/DVD-ROM/DVD+RW drives will revert back to PIO mode but, its a good idea to go ahead and check both why your already here. 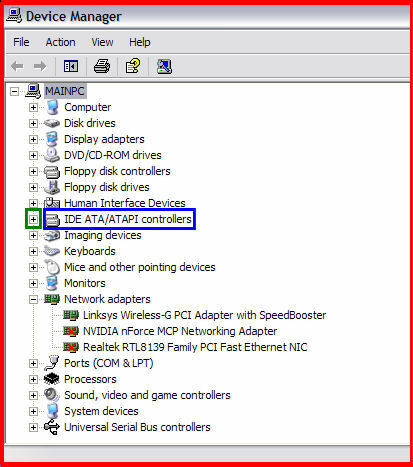 It also tells you how the drives are configured with the IDE cables. 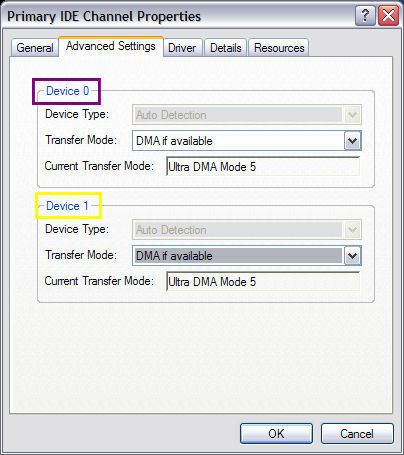 Example, "Device 0" (purple) means that the drive is set at the "Master" position and "Device 1" (yellow) means that the drive is set at the "Slave" position. 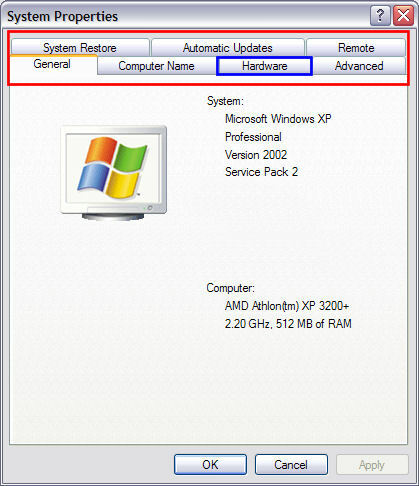 Upon rebooting, if you watch near your PC's clock area, some notifications will pop up telling you it has discovered some new hardware. That is normal, as it is just re-detecting your Primary IDE Channel. It may (mine did) tell you that you have to reboot again for it to be installed properly. Reboot again, and your all set! 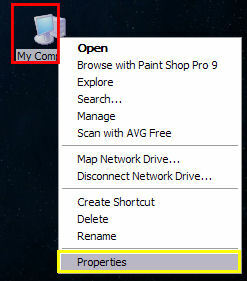 If the "Secondary IDE Channel" is in PIO mode in either box, do the same steps that you did for the "Primary IDE Channel".